Power Leadership from Football Coach Rex Ryan – StratGo Marketing. Plug-in marketing department services. I’m a big fan of the benefits gained from playing organized team sports. Beyond the fun and camaraderie, sports often yield life-long lessons that transcend the fields and courts, which can positively impact personal and professional well-being. While I always played for the fun of it, my experiences from Little League baseball through varsity high school sports have provided invaluable lessons and insights for my life and business career. For instance, I still remember Mr. Jim Ake, my baseball coach when I was 11 and 12, who stressed The Three Ds: dedication, desire and determination. Looking back, it was heady stuff for pre-teenagers. But it made an impression on me that’s lasted for decades. Even though it’s more rooting than playing for me these days, there’s still learning to be had. 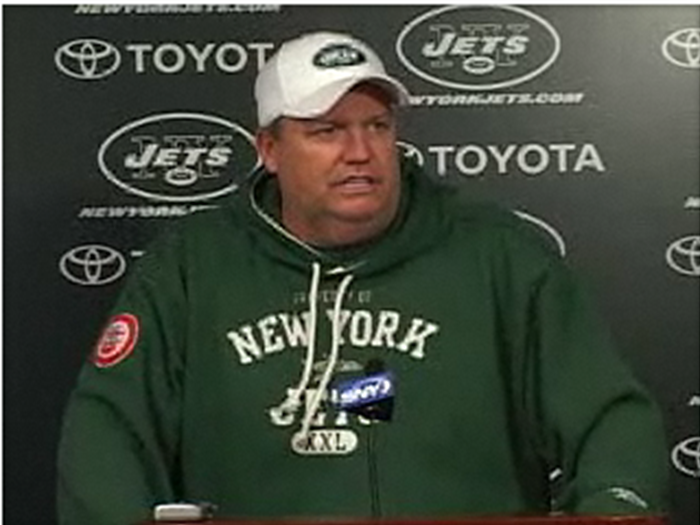 Take Rex Ryan, head coach of the New York Jets football team. In his first season as a head coach, he led the men in green to a surprising and exciting run of three January playoff games, coming up one win short of the Super Bowl. Although I closely followed Ryan during the 2009 season, it wasn’t until I reflected on his post-season comments ( January 25, 2010 press conference following the team’s loss in the AFC Championship Game the day before) that I fully appreciated the leadership system he embraces. A study of Ryan reveals important leadership, communication and motivational insights for business and marketing leaders. Here are eight power leadership principles that I’ve distilled. This quote pertains to Ryan’s pre-playoff distribution to the team of a postseason calendar with the dates of all their workouts and playoff games leading to the Super Bowl. He even included a championship parade in New York City. For this, and an unending public expression of super-confidence during the season, Ryan was labeled a braggadocio and criticized. His approach merits a deeper reflection, though. Regarding the calendar, understand that he was communicating internally to his team. He wanted to make sure his players had the right mindset entering the most important time of the year, the playoffs. Was putting a Super Bowl parade on the calendar presumptuous? Sure. But maybe it was master leadership. Consider this: pointing to the prize, identifying the requirements, visualizing the journey, and believing it can be achieved are all critical factors for success. Business is like sports: you compete to win and if you don’t think you can have success, don’t suit up. This reminds me of the time when my high school basketball coach spoke to us prior to a big game. His comments, unfortunately, left me feeling more like “the other team is great and how can we win” rather than “here’s what we need to do to win.” I remember challenging him for his de-motivational talk, to which he replied along the lines of “I was just trying to make you guys aware of the challenge.” As if we didn’t know. Looking back, a dose of Rex Ryan leadership would have been better. For Ryan, his extended team are the fans. Leveraging easy technology (refer to my related blog post on marketers embracing technology), Ryan made two personal connections with Jets season ticket holders. Prior to the home opener against New England, Ryan sent a telephone message saying the Jets needed their support to win and encouraging them to get fired up and loud at the game. At the end of the season, he made a second phone call thanking the fans for their support and reinforcing that he and the Jets organization would continue to do everything in their power to win a championship.